It is me, your favorite Doxie-Jack, here to spend a few minutes with you visiting and catching up. My friend Barbara wrote: "Abby, can we see you modelling your Thunder Shirt? We have heard about them, but really don't know exactly how they work. Perhaps you can explain, as many pups out there are afraid of loud noises, fireworks & of course, thunder." I am very happy to talk about ThunderShirts! I have no affiliation with them, but am available if they ever want a real life spokes-dog. 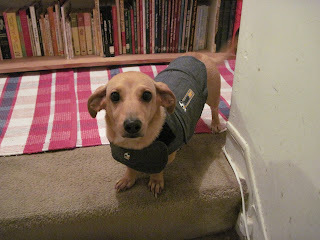 :-) The ThunderShirt is made of a sturdy, felt-like material. Momma wraps it tightly around my body with velcro. It fastens securely at my chest, and around my belly. The gentle pressure of the shirt makes me feel like a baby who has been swaddled. I feel secure when I have it on. Because of my background (rescued stray) I am very frightened of loud noises. My list includes thunder, fireworks, tree surgeons, and roofers. Before, I would pace and hide and almost make myself sick because the noises upset me so much. Now, when the noises start (or on nights where we KNOW there will be noise, like 4th of July fireworks), I get my ThunderShirt on. Momma still puts on music and fans to make happy noise to distract me as well ... but this really helps. We keep the shirt in the bedroom closet, and I go sit by the closet door when the noise starts ... I know my shirt is waiting there for me. Thankfully, I have Momma trained and she always goes right there to get it for me. You can read about the shirts at the official website: Thundershirt.com. They are available at any pet supermarket or pet specialty store. Fireworks have been legalized in our area this year, so we are already thinking ahead to ThunderShirts and the summer holidays! How are you doing this week? Do you have any questions for me? I look forward, all week, to chatting with you here. I always love to hear from you in the comments, below. How cute! reminds me of my Maggie! The ThunderShirt is a great invention for pups like Abby. I have to say that blurry, wagging tail is like two thumbs up all on its own. 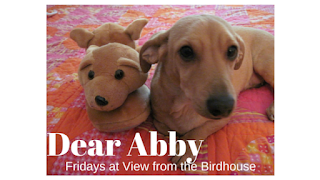 Abby, you are a wonderful walking advertisement for ThunderShirts! What a fun post idea! Abby, you would be great friends with my Chloe and Oliver (Chloe is a Jack Russell Terrier and Oliver is a Shih-Tzu). Oliver tends to get anxious in the car, so that's when he wears his ThunderShirt! Y'all could be spokesman twins! I have heard such great things about Thundershirts! I need to get one for my pup. I'm so glad you shared this! I'm a leasing manager at an apartment community and after a few complaints of a barking dog, I recommend the thundershirt to the dog's human and things have really quieted down a great deal in the community since they took my recommendation. It really helps man's best friend to have that sensation of a hug when they get anxious. Thank you so much for your comments! I enjoyed reading them. Chrissy + Nate, I would definitely be great friends with your Chloe and Oliver! That is great that Nate finds his ThunderShirt helpful in the car. Heather, that is wonderful that you are helping your tenants with that suggestion! Thanks for sharing your thoughts on the Thunder Shirt, Abby And also for modelling yours so we know how it works. I am fascinated that you go to the closet where it is kept when the noises start. That shows you associate it with comfort & security. I like that there is a non medication option for dogs that have real anxiety issues. I wish I had known about the Thunder Shirt for my Auggie & Billy. Perhaps it would have helped them through their anxious times. Awww, I hope she's able to weather the celebration alright. My Lily loves her shirt! It's very helpful during the 4th of July fireworks celebration and thunderstorms. AND the grey color sets off your blonde fur! Thank you for visiting my blog (I just let my Momma write posts here on the days when I'm not in the mood to blog!). Barbara, thank you for sending a question about ThunderShirts! It really helps me and I am so happy to spread the word. My grand dog Shelby needs one of these! She's very afraid of thunder! Hi Lori, thanks for the visit! I bet your grand dog would find a ThunderShirt comforting too. I love mine!